Ignorance Made Us Hungry: 2 Movies, 1 Book. Okay -- I'll concede that all of those have tenuous ties to psychology. 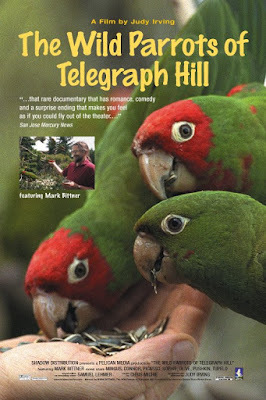 I picked up The Wild Parrots of Telegraph Hill from the student library on a recommendation I heard from one of my classes this semester. 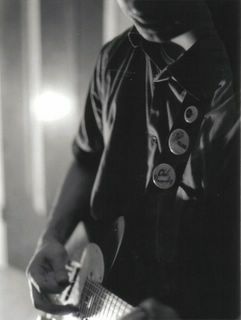 It's a 2005 documentary (with a soundtrack straight out of 1986) about a free spirit guy, Mark Bittner, who moved to California in search of a music career, then did a few odd jobs before realizing that he didn't want to work at all. Somehow, he ended up in an unused cottage on Telegraph Hill in San Francisco. The owners of the property were okay with it... until they decided they wanted to renovate the place. So Mark is given the boot at the end of the movie, and he leaves behind his precious parrots, but don't worry -- it's not all bad in the end. This movie was very powerful. Mark is a very spiritual dude, and it brought out a bohemian part of me. I too wanted to grow my hair long, shed my office job, and just feed the parrots. Of course, he made a lot of sacrifices doing this, but that's to be expected. 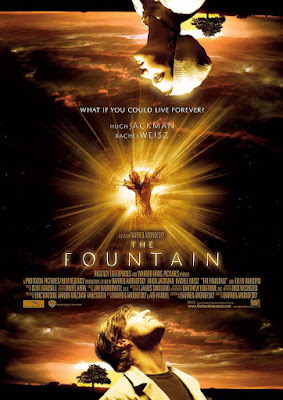 Sunday held 2006's The Fountain. It's a beautifully filmed, hard to categorize movie. It's got elements of sci-fi, fantasy, and even a little bit of horror. But it's also weirdly realistic and you can easily identify with it. But it wasn't what I expected. Instead of a writer's perspective and analysis of the current debt situation, it was instead a writer's perspective on the term debt and it's meaning throughout the ages. Atwood is an apt student of the arts and humanities (especially plays), and she does a few sweeping analyses of religion, plays, literature, and other forms of the arts in her survey of what debt has meant, how it's repaid, and how it helps and hurts both the creditors and the debtors. There are no practical tips here, but there are a few neat revelations. Of how Ebeneezer Scrooge resembles Faust, of how Shakespearean drama fits in, of how religions view moral/spiritual debt, et al. So, if you'd like to read about the philosophical concept of debt, give this a shot. If you want some more practical tips, check elsewhere. Wow, I didn't remember that at all! Ha! And, checking the movie bible, Aronofsky has an upcoming take on "Robocop" as well as a current movie about a wrestler. I'll bet he can pull both films off in style.